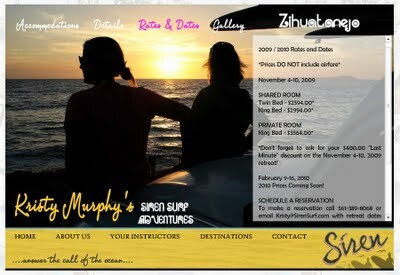 Kristy's Awesome Surf Adventures: The Kristy Murphy's Siren Surf Adventures Website is LIVE!!! The Kristy Murphy's Siren Surf Adventures Website is LIVE!!! Check it out! My new Surf Adventures website is live! For a good time take a look and enter your name to win Siren goodie bags, t-shirts, hats, and skin care. We have 4 exciting surf adventures coming up in 2010, Mexico, Hawaii, Bahamas (Stand Up Paddle) and California. Come join us on an unforgettable trip to surf for the first time or take your skills to the next level. Answer the Call of the Ocean!